Farmhouse Inns have grown to be a British institution when it comes to delicious pub food the whole family can enjoy. The first restaurant, Meadow Farm, opened in Sheffield in 2004. The Farmhouse name has now grown to more than 30 UK locations, hosting fun quiz nights and keeping the kids entertained with indoor play zones. The Farmhouse menu is sure to keep even the fussiest eaters happy. Choose from the sumptuous slow-cooked carvery meats and sides, or browse favourite dishes from the pub classics menu - from tasty pies to seasonal salads, there’s plenty to choose from. Keep the little ones happy with the junior carvery or kids menu, and don’t forget desserts to finish off the meal right! Sit back and sip on a unique ale, seasonal tipple or a glass of wine and relax while Farmhouse Inns do the hard work. Farmhouse don’t just do dinnertime, either - be sure to check out the breakfast buffet to start your day sunny side up! How do I use my Farmhouse Inns promo code? Select the deal you want to use and follow the link through to the Farmhouse Inns website. Here, you’ll get instructions on how to use Farmhouse Inns vouchers or deal. Just get in touch with your local pub and let them know about the deal you’re using when you make a booking! If the kids are on board, opt for a little one’s carvery meal and they’ll get free ice cream for dessert! Where is my nearest Farmhouse Inns? Use the ‘find a Farmhouse’ tool online to locate one near you. How do I find out about events at my local Farmhouse Inns pub? Head to your local pub’s Facebook page for updates and information about entertainment and events! Can I buy a Farmhouse gift card? Yes, you can! Buy one online and load it with the value of your choosing. Give them a call on 0344 800 6605 or head to the contact page to get in touch with the team or make a booking. If you’re after authentic, tasty pub grub, you can’t go past Farmhouse Inns. 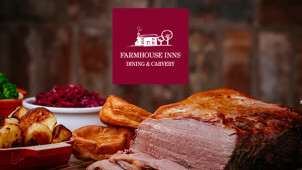 Combining quality dishes, a relaxed atmosphere and service with a smile, Farmhouse Inns tick all the boxes when you want a family-friendly dining experience. With our Farmhouse Inns vouchers you can feed the crowds for less - why not experience a taste of the homemade today? With mouth-watering menus, a sumptuous carvery and decadent desserts, it’ll be smiles all round when you choose Farmhouse Inns! Join the Farmhouse Inns family - sign up to the email club today! You’ll be the first to know about upcoming events and delicious menu additions, not to mention exclusive discounts and deals just for signing up. New members will even receive a welcome voucher to spend on their next Farmhouse Inns experience. For all of these tasty perks and more, head to the website and sign up with your email address. For the ultimate indulgence, don’t pass on dessert. Farmhouse Inns have an impressive selection of sumptuous cakes that are sure to satisfy any sweet tooth! Make the most of Farmhouse offers to save on decadent treats that are made freshly on site. If you don’t think you’ve got space for dessert, don’t worry - you can take a slice (or three) home with the Farmhouse Inns ‘Cakeaway’ service!